Harold Fidler was an Army major and a civil engineer for the Corps of Engineers. 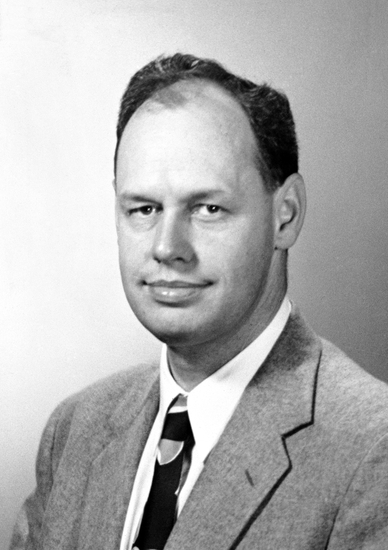 Fidler began working at the Radiation Laboratory at Berkeley with Ernest O. Lawrence in the early stages of the Manhattan Project. Fiddler was responsible for sending weekly reports on the progress that scientists were making to Colonel James C. Marshall, who oversaw the Manhattan Project during its initial stages. Fiddler also ensured that the laboratory received the materials that it needed. In his interview, he discusses what it was like to work under Lawrence, along with the secrecy surrounding the cyclotron and General Groves’ frequent visits. Harold Fidler: I remember when I first heard about the project was the middle of August of 1942. We knew that Colonel [James C.] Marshall, who was a district engineer at the Syracuse District of the Army Corps of Engineers, was being asked to set up a new project. [Kenneth D.] Nichols – who was working with him at the time – Colonel Nichols was to be his deputy in this program. They called me in the middle of August. Groueff: What were you doing at that time? You were with the Army? Fidler: I had just recently been picked up in the Army, although I was still working with them as a civilian employee of the Corps of Engineers. My field is soil mechanics. Fidler: Not physics or anything else. That is right. I had a Doctor’s degree in that from MIT. I had been working with the Corps of Engineers for two years in a civilian capacity in the flood control works, building of dams and retaining walls, things like that. I was in charge of their foundation investigation section in Ithaca, New York, on the campus of Cornell University. The district office was in Syracuse, about fifty miles away. I do not know how far away it is right now. There were several of us who had taken ROTC during our college careers. Key in setting up this Manhattan District was calling in the people that he had known [to have them] staff different parts of the project. I can remember him calling me in then, saying he was going to send you to Berkeley, California, to work with a Professor [Ernest O.] Lawrence there. I had heard of Professor Lawrence when I was at MIT. A number of physicists there were my friends. I thought they were sending me to the end of the world. It turned out to be a very interesting experience. Groueff: That is where you came from? Fidler: That was August 16 . I came out there, and you must remember, the reason I am mentioning this is because Groves got into the project September 11. I came out here and was here for just a few days when Colonel Nichols came out for one of the big meetings, which is written in Hewlett’s book, I think. Lawrence took them up to the Bohemian Grove. Groueff: I have heard of Bohemian Grove, yes. Fidler: That is when Briggs was here, Lyman Briggs. I think Enrico Fermi was there. [Donald] Cooksey will know about it. He went on up to the thing. There was a Colonel Crenshaw, Major Crenshaw at the time, who was out here to be the representative. After this meeting, it was decided that they would – I think Lawrence was trying to get them to get the idea of filling the plant in Redding, California. The Shasta Dam was just being finished. There would be lots of electric power, which you need for a project like this. The construction camp was there. I think at that meeting, and you will have to get this from other sources because I was not there, the decision was made not to build it here because it was too near the coast, they felt, and to place it in Oak Ridge with these other facilities they were going to be building there. They felt there would be enough electricity through the Tennessee Valley System for this project, as well as the others. At that time, Major Crenshaw said it was not going to be a big project here. He was pulled away and I was the only one here representing the Army. Groueff: You were a captain? Fidler: I was a lieutenant at the time. Groueff: Did you wear a uniform here? Fidler: This project was so secret that I was sent out here. I had given away all of my civilian clothes thinking this was going to be a long war. I came out in uniform. When I first arrived, they were horrified to see me in uniform. I had my first identification photo taken in this uniform as a Lieutenant. Major Crenshaw, who was in civilian clothes, said, “I am sorry. I guess no one told you. You have to wear civilian clothes here because this is so secret.” I had just gotten rid of all my clothes. I had some of them in a trunk back East. I had to go out and buy a suit and some shirts, which were not easy to come by in those days, especially on a second lieutenant’s salary. After having gone to see the officers buy their own clothes, I had to buy all my Army stuff and I could not use it. I did not wear it all during the war. Groueff: You were always in civilian clothes? Fidler: Always in civilian clothes out here. When Groves would come out to visit here, he would either change the last day on the city of San Francisco train he would go back and forth on or when he would fly out, he would come to my house first and change from his General’s uniform to civilian clothes. That shook up my landlady one day, when she saw this. It would usually bother the porters on the train a little bit. I guess they were used to those sorts of things. That was part of the fun that we had. Groueff: You lived here in Berkeley or San Francisco? Fidler: In Berkley. I was within walking distance of the laboratory. Groueff: Which laboratory? This building? Fidler: This building was not here. It was on the campus. It was called Donner Laboratory. It was a relatively new building. D-O-N-N-E-R, the Donner Laboratory of Medical Physics. That was given by the Donner family of Philadelphia for experimentation and using the cyclotron for medical purposes. At the start of the war, Lawrence was the one who plunged everything into helping out with this problem. He recognized that is a real problem. From what I can gather, he was one of the spearheads in dealing with getting the scientific community interested in doing something about it. He was a little unhappy with the slowness with which they were pushing this thing. That is the thing I remember when I first got out here, meeting him first. I just could not help liking him. Groueff: When did you meet him first? Fidler: The last part of August, when I arrived here early September of 1942. One of my few claims of fame is that I was on orders number one of the Manhattan District. That was the very first ever. There were about a dozen names there. I stayed with the thing and the Atomic Energy Commission longer than any of the ones that were on that list. I know there was one on this list was still with the Atomic Energy Commission. That was Colonel Blair, Robert C. Blair, who was the manager of the Savannah River land for the AEC now. He had left when there was this breakup, when Marshall went out. Blair and quite a few of the top people went out. I think Crenshaw went out at that time too. There was some sort of a shake-up in the hierarchy in that thing. You can get either Groves or Nichols to go over the details of that. I never did know the inside story of that one. Groueff: You met Lawrence immediately after you came? Fidler: Yes, and his office was on the third floor of LeConte Hall. LeConte Physics, on campus, L-E-C-O-N-T-E. It is just sort of amazing. We had a little attic type of office. The roof was sloped way down with a little dormer window there. It seemed like such cramped quarters in the thing. That was the way it looked. I think we have a photograph of the time when Compton, Carl Taylor Compton – not Arthur Compton – and Van[nevar] Bush were telling Lawrence about the fact that they would step aside so the Rockefeller Foundation would provide money for Lawrence to build this large cyclotron, 184 inches. From that, you can see the cramped quarters of his office. That surprised me. It must have been an office half the size of this room, maybe only one-third the size of it. As I say, you could not help liking the fellow at first meeting with him. He had enthusiasm for anything he went in for. Major Crenshaw took me over. He was still here at the time. He introduced me. After Crenshaw left, I was in charge, pretty soon just having a gal to help with the office. That was called the Berkeley Area Office. I guess we called it the California Area Office, so that we would not pinpoint any one spot. We had a Post Office box in the Berkeley Post Office. I would have to go down there for the mail every day, for our little operation. It was pretty small. Groueff: What was your job after you came here? Fidler: Initially, this was still an OSRD contract with the University of California. It was more or less just to see the sort of work that was going on and report it back to Colonel Marshall, who was my boss – he was the district engineer – or to Nichols. I attended the meetings. The scientists reported how the progress of the work would go. We would send in a weekly report of the things they were working on and the progress that was being made. Pretty soon, it became evident that materials were hard to get. That was when this controlled materials plan was in during the way. Mechanisms were set up for obtaining priorities, obtaining materials or machine tools. I remember very early there that they needed a little punch press. There were many of the aircraft companies way ahead of them for getting this. They need one for this thing. We had to arrange for the priorities to get around all of these other people and get the punch press that was needed here. General Groves did set up, through the Corps of Engineers, the top priority for this job. Groueff: Usually Lawrence would ask you, or some of his people would ask you, for some materials? Fidler: Cooksey would do quite a bit of that work, or Mr. [Wallace P.] Reynolds. The business manager here at that time was a fellow named Kenneth Priestley, who was [inaudible] Mr. Reynolds, by the way, has taken over the combination of those two jobs, the one he had then as managing engineer, but also business manager. He has both of those positions right now. During the war, he was just known as the managing engineer. Fidler: I would always have to go back there to get the authority to assign that, with the justification of why this was so urgent that we obtain this. I can remember tungsten was needed quite a bit for making the filaments for the process that we used here. That was extremely difficult to come by. That was needed in all of the vacuum tubes and the radar industry. We had to make estimates as to what our future requirements for this would be, and try to plan to have this material here in time. Of course, the various visitors – see, the original office was on the island of Manhattan. That is how it got its name as the Manhattan Project. That was before they moved down to Oak Ridge. Soon after this meeting that I mentioned at the Bohemian Grove when Major Crenshaw left, Nichols had indicated to me to not unpack my bags because I might be moving out soon too. Having just arrived, this is like the Army, being prepared to move. I did not move throughout the entire war. I was probably the only one that went to the first assignment and stayed there throughout the war. I did not leave here until November of 1945. Groueff: Always here in Berkeley? Groueff: You did not go to work at Oak Ridge? Fidler: I would visit there occasionally as the place was constructed, or back in Boston for the Stone and Webster place there. Occasionally there would be a meeting in Chicago where it was more centrally located for the people from Westinghouse, GE, Allis Chalmers, or people like Groves to come to attend the meetings, to nail down our next step, defining the scope of the project. You see, I did not participate in any of those major decisions. I did try to keep up to date on the work as it progressed, all the way through. I would report to Marshall or Groves or Nichols the things that needed doing. Groueff: Your relationship with Lawrence was always good? Groueff: He was an easy man to work with? Fidler: Very easy. He was just a wonderful fellow to work with. My main job was to get him everything he wanted. That made for a very nice relationship. I had the pleasure of working with him under ideal circumstances. By the way, the contract with the Corps of Engineers was March 1st or March 15th of 1943—from that time on, I was the contracting officer for this entire project. All the basic documents were signed by Colonel Nichols. I was his designated representative to administer all of the details of the contract. Fidler: That is right. That contract, as a matter of fact, is still enforced. It was amended and taken over by the AEC when they came in on January 1, 1947. I think we are on modification #20 of that, or something like that. It is still the same contract in number, I will say. There are very few words that are the same, except the University of California and things like that. It has gone through several major revisions since then. For some purposes I am not sure I know, we have kept the same one. I think it is mainly for the whole harmless clause, which was based on First World War Powers Act, where the government could hold the university harmless for taking on this work. Groueff: Do you recall some extraordinary difficulties in supplying some materials or instruments? Even some difficulties finding some tools or manpower? Fidler: I do not recall any of that would be really known as anecdotal material that we did get unplugged. We would usually get what we needed. Sometimes we would have to make substitutions. I do not think the project was held up due to the lack of materials. They did not stockpile a lot of things in the hope or expectation. You must remember that this was a research project entirely, and not production. Where they really had the problems was in the production end of things, like Oak Ridge, Allis Chalmers, Stone and Webster, or Westinghouse. Getting the materials they needed for building that huge plant – This was a very big plant. Fidler: I did not apply for that. We did not here, at all. That was handled through Stone and Webster or Allis Chalmers. Stone and Webster coordinated all of the work. As I remember, GE, although this was a direct contract with the AEC as the Manhattan District, GE did the electrical part of things. Westinghouse did the mechanical part of the things – the pumps, the tanks. Allis Chalmers wound the coils for the magnets. All of that was coordinated through Stone and Webster. Stone and Webster was the key for the construction of things. That is where they had a lot of their priority problems and things like that. If we needed something in, they had ordered 1,000 times as much. We could always get a little bit from them, if need be, to help out. Groueff: Do you recall any moments of discouragement here? Fidler: There were times when everyone was working hard. It was a six-day week. Lawrence, who would be one of these fellows that would work around the clock if need be – you were mentioning earlier about taking somebody to Trader Vic’s for something. He had many very nice little parties there, usually with a small group. You would have to go somewhere for lunch. There was no other Trader Vic anywhere else. That was the original one. He had gone there ever since it was called Pinkie Vic’s. That was the original name of it – Pinkie Vic. Trader Vic ran a hamburger stand. That was all it was. That was how he got started. Lawrence was one of his early customers. He and Victor Bergeron had always been very good friends. Trader Vic would always take very good care of them, would hobble over to around him. Of course, he was a great name dropper type. Lawrence would always introduce him to some of these people. It was always a very pleasant affair. What I am trying to say is after the dinner at a place like that, he would invariably come up here afterward to see how things were going, even though it was 10:00 or 11:00, even if he was out someplace until 12:00 or 1:00. He would come up here because this type of operation is an around the clock type of operation. Fidler: Mostly very young people. With the war coming along, they were not yet working on their doctor’s degrees, like Herbert York who was here. Herb York was here during the war. He is now Chancellor or former Chancellor of San Diego. He had been the first secretary of research and development for the DOD. He was working here, and then went to Los Alamos. He came back here afterward to get his Ph.D. He did not yet have his Ph.D.
Fidler: Working for various small amounts. When I first came here, the radiation laboratory had 200 people. You can get those figures from Mr. Reynolds, who has a chart of the growth of it. As I recall during the war, the peak of our employment for the radiation laboratory people was 1,250. Groueff: That is quite a lot. Fidler: Several hundred of those were at Oak Ridge, helping with the operation of the plant. They were the ones who helped get it into production and do the debugging, as they called it then, when things were not working right. It was hard work to get all these things together. Fidler: He was very personable. He would go around and work with them. His enthusiasm was so contagious. He would get the other people interested. He would more or less jump up and down if something was going well. “Gee, that’s great,” and that sort of thing, “That is a wonderful job.” That would be enough to keep that guy going for the next three months. He knew everyone on the project. Groueff: He was definitely the boss? Groueff: They all knew he was the best? Fidler: A very pleasant man to work with. Groueff: He had personal charm? Fidler: And drive and enthusiasm. Groueff: Was he a family man? Fidler: Yes. He had six children. He did not at that time, but after the war. During the war, he did not see too much of his family. He was on the go quite a bit. His family is here, a very lovely family. Groueff: He did not remain in this small, dinky office that you described? Fidler: About three months or so later, there was a building built on campus called the New Classroom Building. That is now the School of Optometry down there. It was made available for this project, when they saw how it was growing. They said we were going to need all this because with the secrecy of everything, we had to make sure that things were protected. We could and did have that. It was a two-story building, a very nice one. He had an office about one-third larger than this. That is what he moved into. That is when Eleanor Davisson – who was Eleanor Irvine then – came over, his secretary. She had been with him for quite some time. Fidler: On the campus. The only thing up here was this building, which I might want to show you over here. It was being worked on when I first came here. Groueff: He was a very young man. He was probably under forty. Fidler: At that time, yes. Groueff: The first few months, you worked in this attic? Groueff: And after, you worked the rest of the war in this new building? Fidler: In this new building on campus. Groueff: Your offices were where? Groueff: Who were his lieutenants, his chief of staff? Fidler: Don Cooksey was his right hand man in everything. He was associate director at the time. I think he was his first and only associate director. Groueff: And also a personal friend? Fidler: Yes. He had known him at Yale before he came out here. Cooksey followed him out here several years later. I am not sure. You can ask Dr. Cooksey. Groueff: Among the scientists, there were [Robert] Thornton? Fidler: Yes, Thornton, and Frank Oppenheimer was one of the top ones. Groueff: Oppenheimer worked here first. Fidler: He was a professor here on campus, of theoretical physics. He was also a professor at Cal Tech at the same time. He would go back and forth between the two schools. Chalmers, Reginald, Richardson – I cannot remember all the names. Bob Thornton will remember. I think he was top with the scientific people. One of his early engineers was Bill Brobeck, who was the head of mechanical engineering. During this same period for the electronic thing, Jim Norton headed up the electronics group and is still here. He might be another person you may want to talk to on that. Fidler: Just about this time, I guess he went back to Los Alamos. He was one of the early arrivals at Los Alamos. As a matter of fact, he helped pick out the site that was to be used. He remembers very vividly that first visit of Groves to the site at Los Alamos. He helped pinpoint where it was going to be. Groueff: Did Groves come here often? Fidler: Yes. He came here for about two days once each month. He was here quite frequently. He and Lawrence hit it off famously. They both liked each other very much. They were both aggressive on the things. Groves did like to come back here. I have always had a very pleasant relationship with him. Groueff: When he came here, you would be his contact? Fidler: That is right. I would usually be around with him. Whomever he wanted to visit, he would usually call the officials of the university. Mr. [Robert M.] Underhill, who is vice president now and Vice President Emeritus, had been the Treasurer and Secretary on the Board of Regents. His university is run by a Board of Regents, by state constitution. He would be the one who would sign all of the things for the Board of Regents, all of the contracts and things, as well as any arrangements that had to be made. They would be handled through him. Groueff: Did he know about coming down? Groueff: The general, you would organize his stay here? Fidler: He would usually organize his own. He would know what he wanted to do and who he wanted to talk to. Primarily, he spent most of his time with Lawrence. They would call a group together, usually when he was here, of about twenty or thirty people, who would give progress reports on what they were doing and what they hoped to do in the next month or so, as well as what the bottlenecks were and what needed a little more work. Each one of the major places, Westinghouse, General Electric, and Stone and Webster had representatives here. Fidler: Yes. They were as permanent as you could be then. Some of them, like General Electric, had some of their scientists working with the scientists here on developing the electrical parts on it. I do not believe Allis Chalmers had people here. They would visit here for getting facts on building the thing. I do not think they ever had any real part of making the things here. That did not have to be tested here, these big coils. The General Electric part, the cubicles or guts of running the electronic part of the system, had to be tested out. They would be brought up here. A model, called the XA of the same size tank that would be used at Oak Ridge, was set up here. They built the magnet to handle it. I think some of tanks Westinghouse was building would come up here. The coils up here were not of silver. They were of copper. Groves said, “You are going to want to keep this after the war,” because he knew us. We were going to want that silver back. We had enough copper to make those coils. We never had any of the silver here at all. Groueff: All the silver was at Oak Ridge? Fidler: That is right. His visits were primarily checking in on where things were going. It was always a busy two days. I would have to go and meet him, either at the train or the airport. I would tell him some of the problems. Groueff: Where did he stay, in a hotel? Fidler: Yes. He usually stayed at the Grand Hotel or the Claremont Hotel. They were the local hotels here. Groueff: How was security here? Was it guarded? Fidler: Yes. Everything had to be; you had to have guards. Everything was classified. That is the reason we got together in one building on the campus. It had a guard at the door. You have to have a badge to get in and out. Of course, there were guards up the hill. Groueff: Was that difficult because of the rest of the faculty? Fidler: They knew that something was going on here, although I do not believe any of them had any idea of what it was. They just knew it was part of the war effort. People put their shoulder to the wheel, to get that going. Groueff: All of those young boys were working as the assistants. Did they know the purpose of the whole thing? Fidler: Which people? The people working here? The majority of them did not. The top people of course did, the top scientific people. Groueff: I see. The young science students only knew the problem they had to work on? Fidler: They were not stupid. They could figure out some of these things. The average workman – let’s take the one in the machine shop. They would have no idea what it was. It was just another job. Most of the electronics people would not know. Fidler: They would have to know. You knew you were separating out these isotopes. There was enough said about it then. William L. Laurence had published something in the New York Times about driving a ship across the ocean on a cup of water, if you could get all the energy out of it. There was enough known about the fission of uranium-235 so that they knew you were separating the uranium-235. That was not called that during the time. The whole Manhattan District Project was called the DSM Project. They never even said what that meant. The idea was that it was called Development of Substitute Materials. They wanted people to believe this could be like butadiene plants coming in as a substitute for rubber. They liked that fiction to continue. Even though it was known as the DSM Project, it was not specified what it was. Groueff: What was the name of Lawrence’s lab, for instance? Radiation? Fidler: This was a radiation laboratory here. After all, this existed long before the Manhattan District. This was officially designated as the Radiation Laboratory by the Board of Regents in 1936. Actually McMillan visited here in 1932 or 1933. He even saw a sign on the door saying “Radiation Laboratory.” You see, this is long before the Manhattan District. We had been in this sort of business for a long time, as you can see. That cyclotron first ran in 1930. Groueff: Probably would be a good idea for me to see that. Fidler: There is a long history. I can give you a detailed account of those in here, of the ones that were built. That was the first, about a four-inch. Then there was a five and a ten. The 37-inch was the first really large one. Groueff: Connected with the Manhattan Project? Fidler: That was used on the Manhattan Project as a mass separator, which is what that is. That was turned over before the 184-inch machine was made into one. He always started things small, to see if they would work, before investing a large sum of money. Of course, Lawrence would work on more than one way at a time. I have heard it said that if they would have done that with the centrifuge process, instead of just working on one little area and spending a lot of time there – work on a half-dozen, and the two most promising ones you continue. You let the others go by the wayside. That is the way he operated. In this one magnetic field up here, I think there were three different types of tanks in there, each one trying to work out a system for separating the U-235. Groueff: You have the history of that? Fidler: I do not believe I have the history. Mr. Reynolds probably does. He can give you some more details of that. I was thinking of the cyclotron itself that you were mentioning. The 37-inch one is the one where I think Pacific Telegraph or one of those places found out they were building a coil for communicating with Japan. Before they got going on that, they had a better method of doing it. This was the spark method, I think, of sending signals. That thing was in the warehouse down there. Somebody knew of it. Lawrence was able to get a hold of that and used that as the magnet for one of his very early large cyclotrons. That magnet, by the way, is is in the warehouse in Richmond now. They are going to be building a Lawrence Hall of Science for the museum. That is going to be right up the hill there. I can show you from here. They are collecting a lot of these things. That is what that is being saved for, for displaying there. Fidler: There is somebody working on that now, a fellow by the name of George Herbert Childs. He has been working for several years. He probably knows more about Lawrence than anyone else right now. Groueff: He is going to write a book entirely on him? Fidler: Just on Lawrence. A lot of these things are being gathered for this Lawrence Hall of Science. It should be a very good historical thing, I think. It is also a growing thing. He always had an interest in instructing people and bringing new people along. Harvey White, who heads this thing up, has always been interested in that. You may recall that he is the one who did the first classroom series on television, on physics in general. He is from the Berkeley campus here. He is the director of this thing. He is quite interested in upgrading high school teachers in science, so that it has a greater impact on the future.